After four grueling years at UC Berkeley, I have finished my degree in Public Health. My reward? 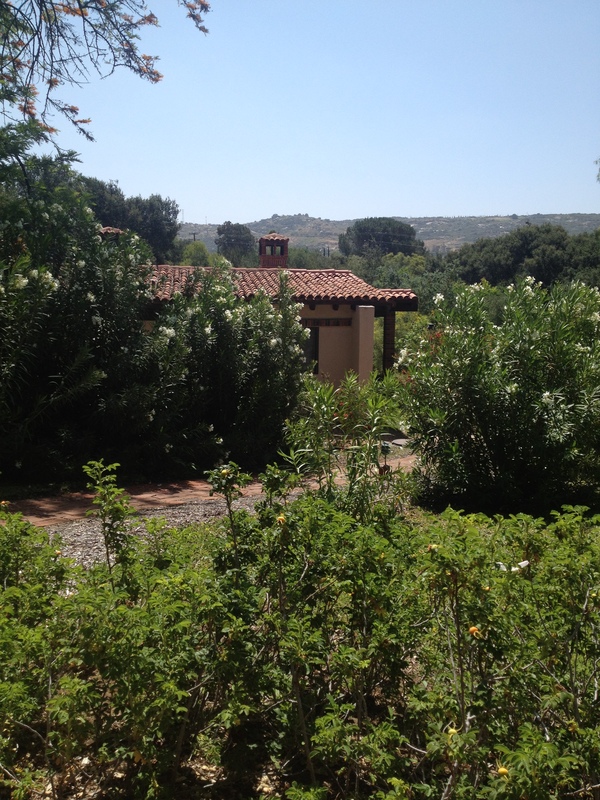 A relaxing vacation at the spa, Rancho La Puerta. Located in Tecate, Mexico, this spa focuses on fitness, wellness and nutrition. Being gluten free makes total relaxation difficult to achieve even when at a spa. Overall, I loved my experience at the Ranch and took home some interesting insights that I hope will improve my gluten free experience. Although I often write about the importance of focus and effort when it comes to being gluten free eg reading labels on products you’ve bought a thousand times or asking about cross-contamination even when you think the dish is safe, I thought that a place committed to health with a focus on food might be an exception. I thought I could drop my guard. What I found at Rancho La Puerta is that this is simply not the case. The cooking classes at the spa are usually taught by their Executive Chef, Denise Roa. However, once a week the spa invites guest chefs to teach. This week, on Gluten Free Thursday, the spa had invited Romney Steele aka Nani, the granddaughter of the founders of the restaurant Nepenthe in Big Sur, California. The cooking class was set up so that groups of two spa guests would make one dish using a recipe provided by Nani. I was working with my Aunt Celia on a baked Sea Bass dish with an orange and tarragon relish. The menu was out of this world. 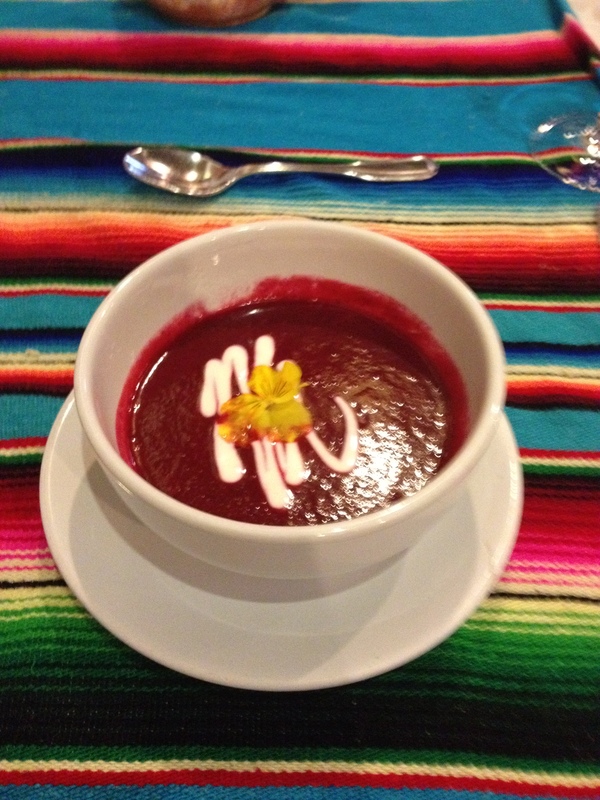 All of the ingredients were picked fresh from the Ranch’s vegetable garden. In fact, before starting the class, the spa guests had to go pick (literally) their ingredients from the garden. All of the recipes were gluten free and things went smoothly for the most part until we encountered a problem: Nani included a recipe for a pea puree that needed some form of chip/starch-medium to eat. Because this was overlooked when preparing the class, Nani asked one of the workers to go grab some pita bread from the back for the dish. See the problem? If someone had blindly accepted the sign on the door saying “Gluten Free Thursday” they might not even think to ask if the pita bread was gluten free. My Aunt and I quickly noticed and spoke to Nani about the gluten situation to which she replied “Well, you don’t have to eat that dish.” Despite this discouragement, the Executive Chef, Denise, was horrified at the lapse in gluten free practice and grabbed and grilled some corn tortillas to replace the pita bread. I don’t usually post recipes but two of the GF dishes we made were simply too good not to post. If interested in some of the recipes I cooked during this class click here for the Quinoa with Cumber and Mint recipe and for the roasted Sea Bass with Orange-Tarragon Relish recipe. The take away point? Even when places advertise something as gluten free remain vigilant. I have read this advice on many blogs, pamphlets, books and websites but I never really understood it. Ordering simple, healthful dishes can make being gluten free a lot simpler. At the Ranch, I found that this was absolutely true. Why is it not until now that I experienced the ease that accompanies simply prepared meals? Simple foods are hard to find at restaurants! 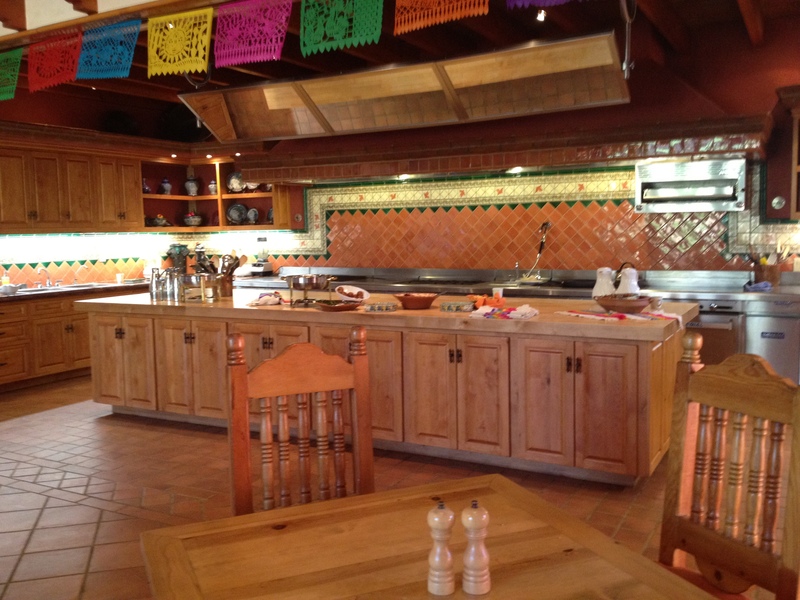 At the spa every dish was made with ingredients found in their gardens or grown within a 30 mile radius of the Ranch. When you looked at the meal, you could tell what components made up the dish. Of course, you should always check about sauces and ingredients but I noticed that dishes that are truly simple and truly healthful aren’t muddled with questionable ingredients. The Beet and Basil Salad was a salad made up of…well, beets and basil. The extravagant, calorie-laden entrees that you find at most restaurants make being gluten free so complicated! If I saw “Carrot Soup” on a menu at most restaurants, I would not order it. It may have flour as a thickener, contain malt vinegar or come garnished with fried onion crisps. At the Ranch, I knew the Carrot Soup was made of carrots and more carrots. I haven’t quite worked out how to use my new insight about simple, healthful foods to improve my gluten free lifestyle but when I do, I’ll be sure to post. For now, I am simplifying the meals I make at home and trying to choose simple items at restaurants but still accompany my order with a long series of questions. Insight #3 Apparently, Being Gluten Free Is Hard, So Be Nice To Yourself! 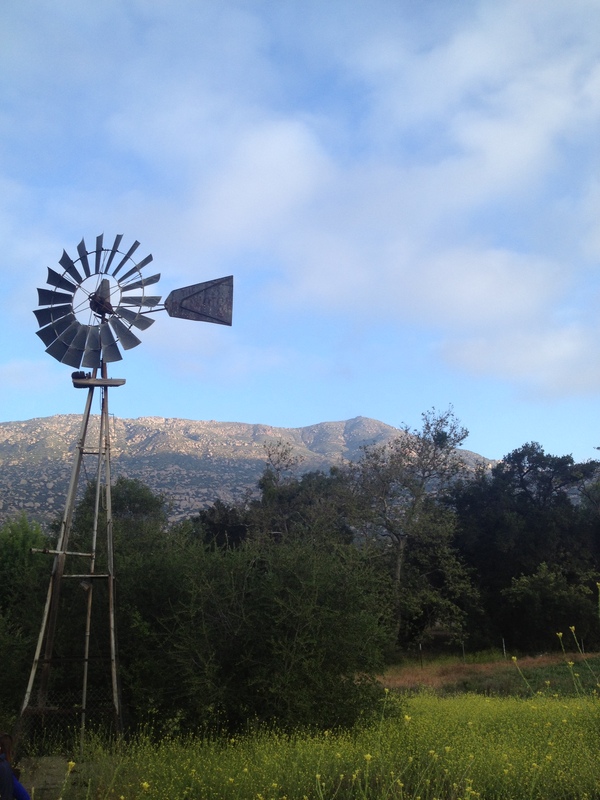 Rancho La Puerta is a spa dedicated to health and fitness. The spa’s clientele are hyper-aware of their diets and have strict exercise regimes. These people demonstrate the type of dietary discipline I can only dream of. They eat only what they need. In other words, teeny tiny portions. They limit their sugar intake, their meat consumption and their dairy consumption. They exercise every day and, when given the choice, choose the salad entrée over the hamburger with fries. It was so nice and refreshing to hear other people commenting about the difficulty of being gluten free. It is a thankless job, demanding self-discipline, constant vigilance, intelligence and the ability to not only articulate your needs effectively but to advocate for your health in the face of constant obstacles. It is funny but talking to the health nuts at the spa about the gluten free diet made me kind of proud that I am gluten free. Take away point? Every now and then, take a moment to appreciate yourself and all the work you put in to being gluten free. Most people don’t know how much effort it takes to truly be GF. Just remember to be kind to yourself and be proud of the fact that you are gluten free. Although I couldn’t help but think about my blog while at the spa, I did manage to relax and decompress from four tough years at UC Berkeley. I hope to bring my insights from the spa home with me by practicing constant vigilance, choosing simple healthful meals and appreciating my GF efforts and I hope that you do too! Many families celebrate Easter with a dinner party. I know in my family, the food served and attending guests are very much grounded in tradition. Many, if not most, Celiacs are not diagnosed as children and, consequently, their family dinners and traditions may be a gluten free obstacle that they will face this Spring. Families of Celiacs diagnosed at older ages may not be as familiar with the gluten free diet and how to accommodate their family member as a family that raised a Celiac child. How do you work around such a challenge? There are various reasons why trying to tweak your family dinners to be GF may be more difficult than simply telling the appointed cook not to use flour to thicken the gravy. If you were recently diagnosed then this may be your first Easter dinner, if not your first big family dinner, since becoming gluten free. Learning about all the complex components of the GF diet is overwhelming at the best of times, let alone during a hectic holiday filled with out of town relatives, family feuds and the like. How can you get your family on board with your new lifestyle? Talk specifically to the host and/or the family cook. If you aren’t comfortable speaking to your entire family or if you simply don’t have time to explain the intricacies of the GF diet to your entire family, be smart about who you talk to! Around the holidays, time is of the essence. Figure out who is cooking and make a plan — find places where you can substitute GF ingredients and double check all the family recipes and ingredients that will be used. Not everyone has the time to travel to wherever their families may live. Maybe you have recently moved to a new city and don’t know many people. In these two situations you may be going to an Easter dinner at a new friend’s or a friend of a friend’s house. What if you aren’t able to get in touch with the host before the dinner party? If this is the case, bring an entree or a substantial side dish to the party with you! It is completely normal and, often, encouraged to bring a gift or contribution for the host of the dinner party. Give this gift a dual purpose: a gift for the host, demonstrating incredible etiquette and something filling you can eat, demonstrating incredible preparedness. There are many simple GF dishes you can bring the an Easter dinner that are filling and delicious. Try making a quinoa dish, which will be an acceptable side dish for some and, if need be, a main entree for yourself. I suggest this springtime recipe for a quinoa dish! Another easy and filling option is roasted vegetables. This is very easy to make and is both a homey dish and a very nutritious one! I suggest picking up fingerling potatoes, carrots and fresh beets. Chop all the vegetables into similar sized bites and season with olive oil, garlic power, onion powder, oregano, salt and pepper. Spread the veggies out on a cookie sheet and roast in the oven, set at 400 degrees, for ~30-40 minutes or until tender. 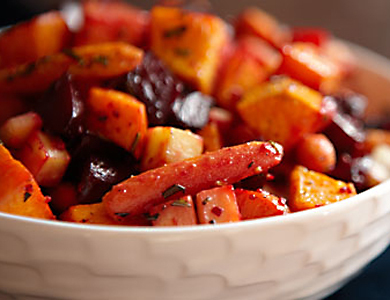 The beets and carrots add a sweetness to the potatoes that will surely impress the host of the dinner party. If not these dishes, I highly recommend brining either a starch (rice, quinoa, potatoes etc) or a meat/poultry dish (a whole, stuffed chicken or a small honey baked ham). You want to bring something that is substantial enough to serve as your meal so that you are not a lone starving guest. This year there are a ton of great GF resources on the web specifically for having a GF Easter. Gluten Freeville posted a 2012 GF Ham list! I highly suggest using this resource before purchasing a ham for a dinner party. 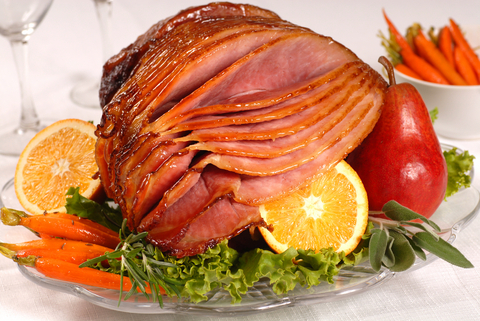 Last Easter, I bought a ham that was labeled GF but the glaze on the ham was NOT gluten free! This was a tricky labeling problem that I overlooked and greatly regretted it! Make sure you find a ham that is safe, I even suggest calling the company to double check the GF status of their product. I love enjoying classic food items that are naturally gluten free. It makes me feel like I have a super normal and easy diet! Peeps are an Easter classic. 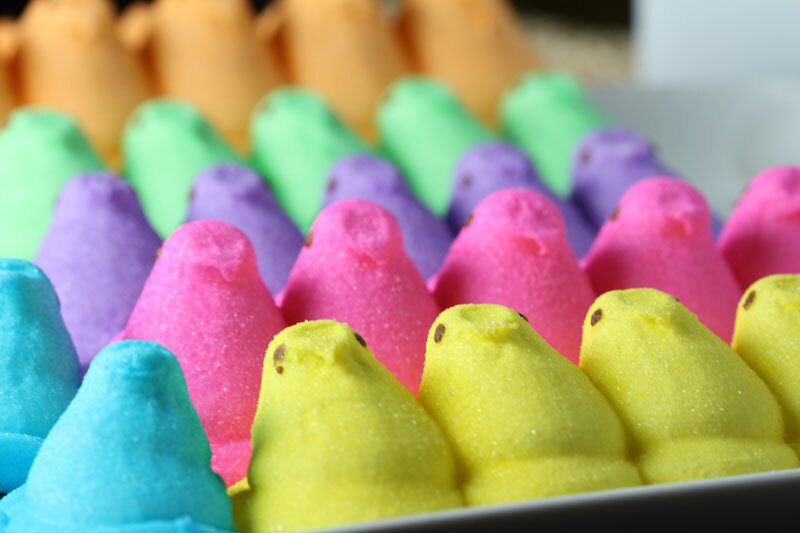 Though completely devoid of nutritional value, Peeps are a fun, sugary and gluten free dessert you can munch on with your friends. To top it off, unlike many GF substitutes, they are incredibly cheap! Bring a large pack of peeps to the Easter dinner party you attend as a dessert. Even if the host is serving a seemingly delicious glutinous cake, I would bet my blog that the majority of guests won’t be able to pass up the nostalgic, sugary goodness that is Peeps. Good luck with all of the dinner parties! I hope that these strategies are useful and make the holidays a bit less stressful for everyone!